Duplication, duplication. I’ve already reviewed the Violin Concerto in its appearance in Decca Eloquence’s wide-ranging Ricci series of releases and in the Decca Original Masters box devoted to the violinist. I’ve reviewed the Lympany recording in its latest incarnation in the huge Decca FFRR boxed set. 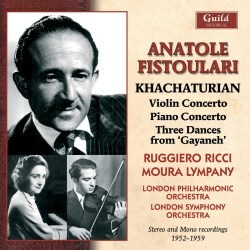 Ricci recorded the Khachaturian Concerto with the LPO and Anatole Fistoulari in July 1956. The first recording of the Concerto was the famous one with Oistrakh and the composer in 1944 (available in Britain at the time on Decca 78s). Shortly after that came Louis Kaufman’s incredibly fast recording with Rachmilovich in 1946 but Ricci’s came just in time to precede Kogan and Monteux’s sensational 1958 disc, made in Boston. Compared with the Oistrakh and the Kogan, Ricci is, perhaps surprisingly to those who have assumed him a speed merchant here, rather sedate when it comes to tempi. His is an approach long on atmosphere and lyricism but, at times, rather missing out on the one thing Ricci usually provides which is daredevil panache. He’s a full two minutes slower than Oistrakh in the first movement, a minute and a half slower in the second and half a minute slower in the finale. These matters of tempo demonstrate that Ricci’s priorities here are clarity of exposition and a generally unhurried approach to inner part writing – and matters such as the dialogue between the soloist and the clarinetist in the first movement cadenza for example. The expressive drama at the crest of the second movement, with its powerful brass-led writing, is the more noble and coursing because of the slightly slower speed. Ricci’s passagework in the finale is clear and biting and plenty of orchestral detail is allowed to register. Looking back later in his life, though, the violinist remembered that the conductor insisted on beating three, not one, in the finale, thus slowing things up, to Ricci’s intense indignation. As befits Ricci’s imperturbable individuality this is an individual reading and unusually relaxed. Maybe that quality was at least partially dictated by Fistoulari. Lympany was a prominent Decca artist and those unfamiliar with this 1952 mono recording will welcome the Original Masters release for the entirety of her Decca recordings. Note that she had also made an earlier recording of the Khachaturian with Fistoulari, the premiere recording of the piece in fact, and a work with which she was strongly associated. In some ways the wartime 78s are more combative and bravura, though they are less easy to get hold of given the existence of this early LP version which was recorded to supplant it. In particular, I’m not sure why the LP transfer sounds so murky but it always did – John Culshaw was producer for both and fell short in this recording. There’s a little bonus in the form of Three Dances from Gayaneh, idiomatically directed by Fistoulari now unshackled from collaborative duties. The transfers are effective and the notes good, but we’re back where we began, with duplication.